L'Atelier LAT46 Selection Spéciale Box of 20, packaged and sealed with Boveda for Humidified Shipping! The flagship L'Atelier line recently scored a 94 in Cigar Aficionado and is based on a new wrapper that was grown in Ecuador by the Oliva growing family. The wrapper is Sancti Spiritus, a hybrid of Criollo and Pelo de Oro, the "lost seed of Cuba". 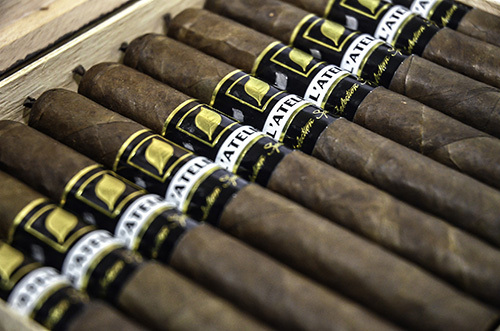 The LAT46 Selection Spéciale features the same blend as the L'Atelier line, but uses the highest priming Sancti Spiritus wrappers coming out of the sorting process. Darker in color, these higher priming wrappers change the flavor profile along with the smaller ring gauge.